These easy roasted brussels sprouts are fabulous. 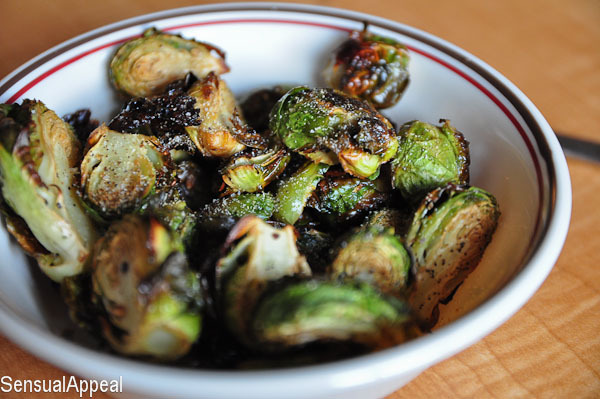 I love them because they are a perfect side dish to any main entree plus they only take a few minutes of prep then you put them in the oven and there ya go – oven roasted brussel sprouts! This isn’t a recipe. It’s too simple to be called that. I contemplated not posting this at all but since I’m recording all of my culinary adventures, I thought I should post it after all. 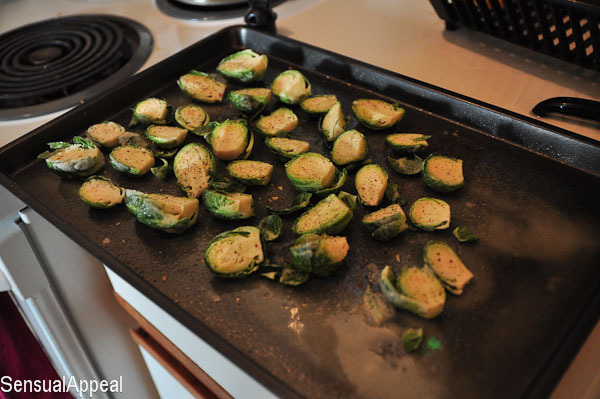 This is a simple post telling how to roast brussel sprouts in the oven. Yes, I used the oven even though it’s hot outside. Thankfully I have air conditioning and I don’t care about the heat. I’ve had these brussels sprouts in my fridge for about a week and I’ve been meaning to make them, finally I came around to it. It’s so simple but since I’m not exactly kitchen fluent yet, I can’t guess how many minutes to put it in or at how high of a temperature to keep it at. So then that’s why this post was written. Even though many of you might be like “duh?”, this post is FOR ME too! I have been treating my blog as an online diary and notebook, kinda, that contains all food/health/fitness related stuff. So there. That’s that. By the way these roasted brussels sprouts were very yummy and reminded me of veggie chips. Well some of the leaves got very crunchy and the salt made them really similar to chips (I never eat chips, really so I could be far off, haha) but the flavor overall is very good and perfect for a snack, not just as a side dish. and here’s how they look like before the oven…. PS. The whole time I was referring to these as broccoli sprouts lmao and then finally it hit me that it’s not the right name. I knew something sounded off! #sillygirl. Do you enjoy roasted veggies? What’s your favorite? Yes, I’m glad you posted them! They have an awesome colour to them! I love to roast brussels sprouts this way. Haven’t done it in awhile, will have to buy some. Pingback: Link Love – Thursday Edition | Nikki B. On T.V.